Pharmaceutical makers, rehab facilities, security firms, prisons and funeral homes profit from the country’s addiction crisis. Now a pet-medicine seller stands accused of cashing in. The U.S. economy of addiction has grown so large that most consumers are numb to its presence. 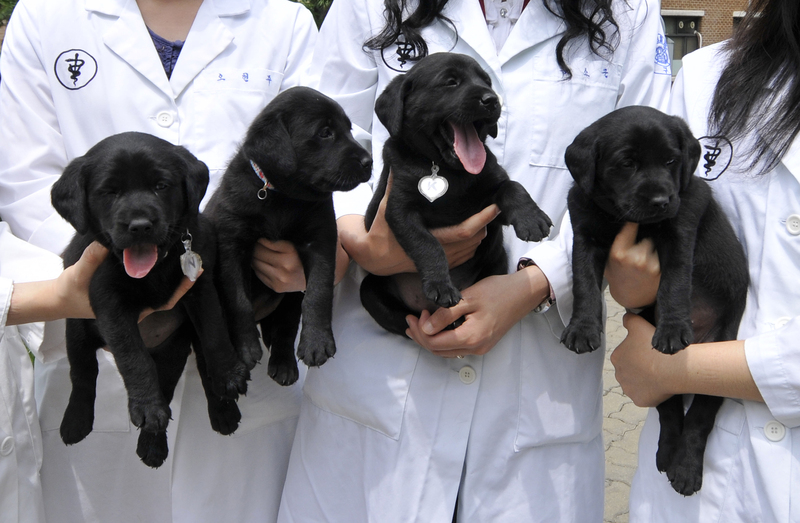 Four puppies, cloned from a labrador retriever, pose for a photograph with researchers at Seoul National University's College of Veterinary Medicine in Seoul July 1, 2008. PetMed Express stock fell as much as 18 percent on Aug. 23 after a pseudonymous research report claimed that sales of drugs to human opioid addicts contributed to the company’s strong profit growth in the past two quarters. The online pet-medicine retailer’s stock doubled between May and June. The report claimed the company spends heavily to advertise online using search terms that would lead addicts to pills that the company sells as painkillers for animals. PetMed Express denied the claims, calling them defamatory. It also said two drugs mentioned in the report, Tramadol and Gabapentin, accounted for less than 1 percent of sales and were dispensed only for animals with a valid prescription from a veterinarian.